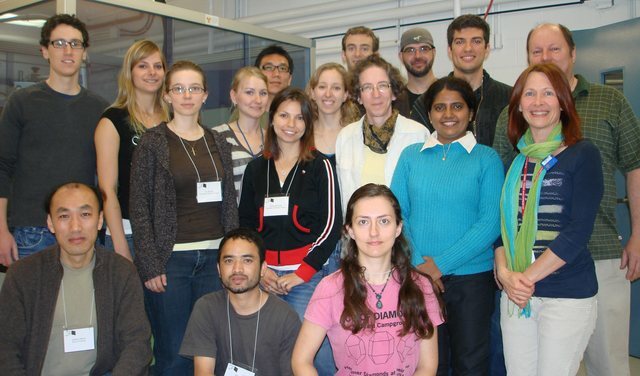 Participants from the first Chemical Crystallography Workshop held at the McMaster Analytical X-ray (MAX) Diffraction Facility, Hamilton, Ontario. Back row: Brad Hernden, Jess Priem, Vicky Jarvis, Po-Heng Lin, Christine Caputo, Ian Mallov, Darren Mercer, Nick Vukotic, Jim Britten. Centre row: Liz Strong, Aneta Borecki, Jeanne Paquette, Kalpana Maheria, Hilary Jenkins. Front row: Qiang Wang, Chhatra Khadka, Varina Smith.